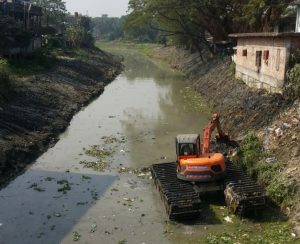 Finally dredging has started in the section of Basheay River flowing through Biswanath Bazaar. Most of the dredging before and after the Bazaar has already been completed but due to objections from different people who have built on the river side this section was delayed until now. Basheay River once a mighty river flows through the centre of Biswanath and provides a river link to Sylhet by joining Surma River. Once upon a time this River was the main transport route for bringing goods and livestock into the Bazaar. You can see below the state of Basheay River before the dredging started. As a community we need to protect our Rivers and ensure it is kept clean and flows all the rain water without causing floods. Pictures provided by Mamun Ahmed, Chowdhory Gaon, Biswanath.